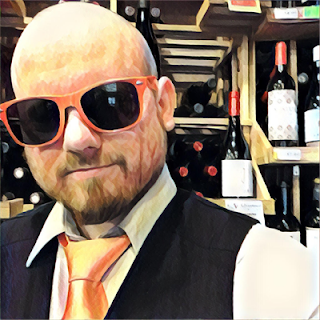 A few days ago I revisted two new vintages of Domain Boyar varietals that I reviewed a few years ago. One did a little better and one did a lot worse, but in my experience the only thing that Domaine Boyar does really well is Merlot. 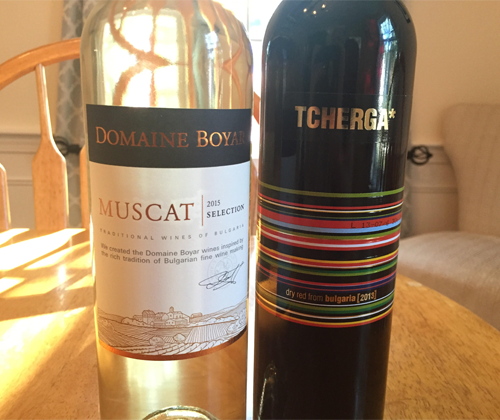 Today I'll be trying their Muscat, and then moving onto a different brand: Tcherga by Domain Menada. You probably know Muscat better by its more common name here in the States; Moscato. Usually, when referred to as Moscato (its Italian name), it's going to be sweet. But not all wine made from the grape is sweet, and this is one of them. With a 12.5% ABV, this is going to be much drier than Moscato. Those guys come in anywhere between 5% to 7% in ABV, leaving much more residual sugar in the bottle. What makes this even more interesting is that Muscat is the grape that is used to make the vast majority of Bulgaria's famous spirit rakia. So I'm looking forward to trying some Bulgarian Muscat! The color of the wine is a straw yellow. On the nose there's mangoes, peaches and honey. It has a medium body, low acidty, and a slick mouthfeel. There's flavors of mangoes, apples and cilantro, finishing with those same apples and cilantro. I'm really diggin' this Muscat, man. It's exactly what I was envisioning in my head for a dry Bulgarian Muscat, and I'd love to one day drink some with a bowl of Black Sea mussels. This red blend is produced by Domain Menada and it contains 50% Cabernet Sauvignon, 30% Mavrud (native Bulgarian varietal), and 20% Merlot. It has an ABV of 13.5%. I actually really like the tacky label. The color of the wine is ruby red. The dark stewed fruit and herbs from the Mavrud are immediately noticeable on the nose, as well as an alluring earthiness. It's plums and blackberries and black olives, tarragon and vanilla, and wet sand and sawdust. Damn, that's a nice nose. The wine has a medium body, sweet tannin, and quiet acidity. On the palate it's the same plums, blackberries, black olives, tarragon, vanilla, wet sand and sawdust. However, while reviewing, I acted on my instinct that these flavors would be more expressive with a slight chill. And I was correct. I enjoyed this wine, and I'd take it any day over many of the wines floating in the ocean of $11 Cali blends flooding the market right now. Such a wonderful wine! Where we can buy them?